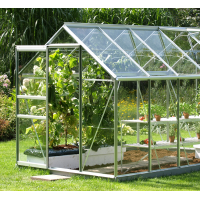 Fed up with damaged greenhouse glass or shed windows? Our clear acrylic perspex is an ideal replacement for broken glass panels. They are strong, lightweight, shatterproof and have a transparency rate clearer than traditional glass. We've made buying perspex shed windows or greenhouse panels easy by pricing up four of the most popular sizes. We also have a custom sheet size option with instant price calculator.